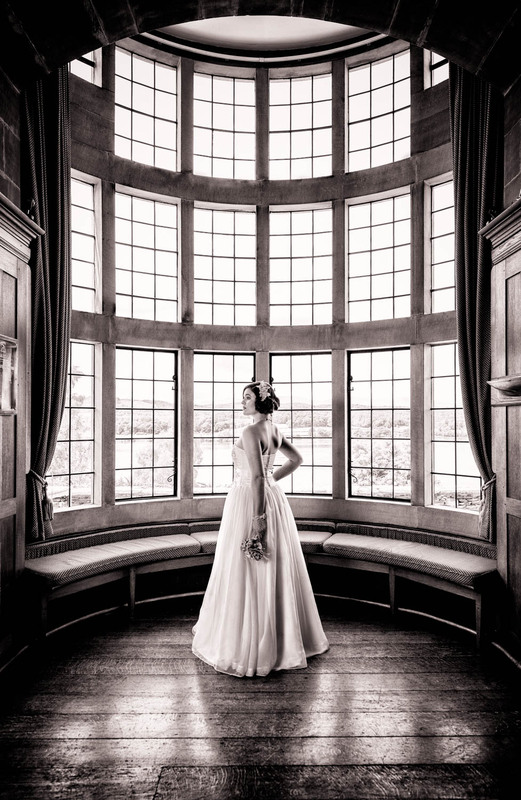 Black and white wedding photography connects with the viewer in ways that colour can struggle to match. Please bear in mind that all I am trying to do here is explain why black and white wedding photography is important to me. So let’s get something else straight from the off. I am a big fan of colour wedding photography! It’s just that I am a fan of colour when it warrants it and when it suits it. Otherwise, I will turn to black and white wedding photography all day long. All my wedding and portrait photography awards have been gained for my black and white work, which should say it all. But I have now decided that I need to explain myself in a little more detail. If a couple comes up to me and asks if I do more colour, my answer is always ‘if I think it’s right for your wedding’. There is nothing that turns me colder than if someone says that they just want all colour for no particular reason. If that is what they want then that is fair enough, and someone else will be shooting their wedding. However if it was a particular theme or of Asian variety, I know I’m in for a colourful visual treat, so no problem at all! My people are the ones that love what black and white wedding photography stands for and adore its potentially more artistic edge. There are also those who may prefer colour, but are open to being educated as to when to prefer it. This little feature explains further why I prefer black and white wedding photography and prefer to be known as a black and white wedding photographer. I started offering wedding photography professionally in 2012. I had successfully completed several test runs with volunteers and found that my black and white wedding photography won the battle in a number of areas. Being a corporate level graphic designer, I am always biased to contrasty imagery that has a bit of extra thump to it. Technically, there was plenty of room to hone my skills, but stylistically I found that a greater documentary approach suited my personality. Being a commercial artist means that I will always approach my photography imagery in a unique way to me and be very particular about its presentation. Otherwise, there is no point doing it. I was not particularly interested in endless groups (not necessarily the case now). I wanted to capture the fun of the day by silently following the couple and the guests around and watching what high jinx they got up to. In many cases, I got more than I bargained for with hilarious consequences. The tabloid like quality was adding to the moments as well, highlighting my passion for finding a quirky ambiguity in scenes. Although traditional or classic wedding photography is not what I am known for, it is now something I possess in my arsenal. Black and white can really make a more classical image more beautiful than you could imagine. Take for instance, the photograph here which won the BIPPNW Gold Award. While not overly posed (very much my thing) it has a jaw dropping beauty that the colour version did not get near. There are other aspects to the image as to why it hits the right buttons. Please read on! Power turns a good black and white wedding photo into a great one. More often than not, colour versions dilute the message. Black and white versions get straight to the core of the moment and it can be in ways you least expect. Knowing when and how to manipulate it makes all the difference. Contrast is another major element of my black and white wedding photography. However, you have to be careful with treatment. I like punchy contrast – good blacks, but with plenty of detail. Some less than qualified photographers’ idea of black and white photography can be dreadfully grey, washed out and plain dull. So no wonder most people don’t like it. Then again too much black takes away any subtlety that may be required. Revisiting photos that I have taken during my ‘rawer’ period of five years ago made me realise that I could be too heavy handed with the blacks. You have to know when and where. So it is a balancing act. When you get the levels right, boy do you get hit with the clean weight of the image! Black and white wedding photography gives images a more timeless feel as well. How many times have you looked back at wedding photos and laughed at the dodgy or dated decor of a venue? It’s not so obvious in black and white. It will also do a better job of nullifying background elements that may be seen as distracting if left in colour. Therefore black and white wedding photography became the style I was most comfortable with. Is there any point with colour wedding photography? Of course! Colour has its moments, but I found for me that it tended to be only when colour really suited. If there was an element or feature with a strong colour combination, then I would always use it. Black and white would obviously lose the colour that made the image important and characterful. See the image here – a fine example where it’s the colour that makes it. On this occasion, the black and white version loses the power as the image has very low contrast overall. Therefore colour needs a special level of respect befitting of the format. It’s knowing when and how to use it. That said, I still hand over a full compliment of colour images. The couple may have booked me for my black and white wedding photography, but there will be guests that don’t understand and get quite miffed if they can’t have a shot in colour!